By immunoelectrophoresis and ELISA this antibody reacts specifically with Rabbit IgG and with light chains common to other Rabbit immunoglobulins. No antibody was detected against non-immunoglobulin serum proteins. Part of the AbExcel range. Our Abpromise guarantee covers the use of ab97051 in the following tested applications. ELISA 1/10000 - 1/100000. (Primary). Western blot - Goat Anti-Rabbit IgG H&L (HRP) (ab97051)Mamedov et al PLoS One. 2017 Aug 21;12(8):e0183589. doi: 10.1371/journal.pone.0183589. eCollection 2017. Fig 4. Western blot analysis of co-expression Bacillus anthracis PA83 (A), Pfs48/45 (B) and Pfs48/45-10C with bacterial Endo H or PNGase F in N. benthamiana plants. (A) Western blot analysis of co-expression of PA83. Lanes: 1- N. benthamiana plant was infiltrated with pBI-PA83 construct, for the production of glycosylated PA83, 2,3- N. benthamiana plants were infiltrated with combinations of the pBI-Endo H/pBI-PA83 or pBI-PNGase F/pBI-PA83 constructs, for the production of Endo H (2) or PNGase F (3) deglycosylated PA83 proteins. (B) Western blot analysis of co-expression of Pfs48/45. Lanes: 1-N. benthamiana plant was infiltrated with pEAQ-Pfs48/45 construct for the production of glycosylated Pfs48/45;2,3- N. benthamiana plants were infiltrated with combinations of the pBI-Endo H/pEAQ-Pfs48/45 or pBI-PNGase F/pEAQ-Pfs48/45constructs for the production of Endo H (2) and PNGase F (3) deglycosylated Pfs48/45 proteins. 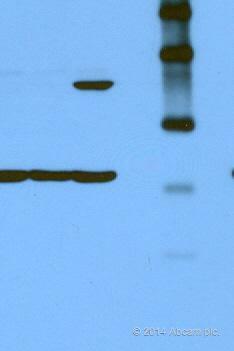 (C) Western blot analysis of co-expression of Pfs48/45-10C. Lanes: 1- N. benthamiana plant was infiltrated with pEAQ-Pfs48/45-10C construct for the production of glycosylated Pfs48/45-10C; 2,3- N. benthamiana plants were infiltrated with combinations of the pBI-Endo H/pEAQ-Pfs48/45 or pBI-PNGase F/pEAQ-Pfs48/45constructs for the production of Endo H (2) and PNGase F (3) deglycosylated Pfs48/45-10C proteins. gPA83- glycosylated PA83; dPA83- deglycosylated PA83; gPfs48/45: glycosylated Pfs48/45; dPfs48/45: deglycosylated Pfs48/45; gPfs48/45-10C: glycosylated Pfs48/45-10C; dPfs48/45-10C: deglycosylated Pfs48/45-10C. M: MagicMark XP Western Protein Standard. PA83 proteins were detected using the anti-Bacillus anthracis protective antigen antibody BAP0101 (Cat. No. ab1988, Abcam); Ps48/45, Endo H or PNGase F proteins were detected using the anti-FLAG antibody. Pfs48/45-10C protein was detected using the purified anti-His Tag antibody. IHC image of beta Actin staining in normal human colon, formalin-fixed and paraffin-embedded tissue*. The section was pre-treated using pressure cooker heat mediated antigen retrieval with sodium citrate buffer (pH 6) for 30mins. The section was incubated with ab8227, 3 µg/ml overnight at +4°C. An HRP-conjugated secondary (ab97051, 1/2000 dilution) was used for 1hr at room temperature. The section was counterstained with hematoxylin and mounted with DPX. 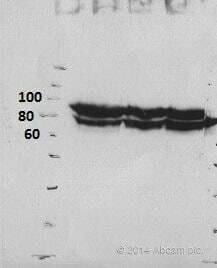 Western blot - Goat Anti-Rabbit IgG H&L (HRP) (ab97051)This image is courtesy of an anonymous Abreview. 10 % gel. Blocked with 5% BSA for 2 hours at 25°C. Incubated with the primary antibody for 1 hour in TBS-tween at 25°C. Publishing research using ab97051? Please let us know so that we can cite the reference in this datasheet. El anticuerpo a funcionado perfectamente, por lo que puedes mandar la segunda unidad cuando quieras. Gracias por tu respuesta. Me alegra oír que este secundario os ha dado buenos resultados. Ya he realizado por tanto el nuevo pedido completamente gratuito del mismo anticuerpo: ab97051. Recibiréis una confirmación automática del mismo con más detalles. Si necesitáis cualquier información referente al pedido, no dudéis en contactarnos, referenciando el número de éste: XXXXX. Si tuvierais cualquier otro problema, o requirierais mas información / asistencia, por favor, no dudéis en volvernos a contactar. Try to load at least 25-30 ug total tissue lysate per lane onto the gel. I have already load 40ug of total protein. Do you means that i need to load less? Thank you for passing some information to me. I understand that ab3583 has been used previously at 1:4000. Have you had a chance to test this antibody at dilutions of 1/500 or 1/1000 (for 1 hr at room temperature or overnight at 4oC? Would you prefer to get a new vial of the primary antibody? Please do let me know how you wish to proceed. This antibody works well for western blotting assay. The antigen I detected in the attached blot is 42 kD, the result looks great with this antibody (1:5,000 dilution). this antibody works stably at a dilution of 1:4,000 for western blot assay. always works for WB at a dilution of 1:5,000. Great secondary, works as promised. We stock and use this for many of our westerns, gets the job done! 1. The concentration of Goat Anti-Rabbit IgG H&L (HRP) used for this experiment is 1:5000 and incubated for 2 hours. 2. Proteins were blocked with 5% BSA in TBS with 0.1% TritonX-100. Abcam's anti-rabbit HRP is very reliable and economical to use. We ended up using 10x less than our old antibody from a different company. Since it is so robust, we started calling it the "epic rabbit antibody" to distinguish it from the old one we have in the lab. The lower band in the gel corresponds to beta-tubulin (ab6046) followed by anti-rabbit HRP (ab97051) while the upper band is a different 70kDa protein followed by anti-mouse HRP (ab97023). Detection of delta catenin in mouse ES cells. Secondary worked very well. Used at 1:5000. This product has been tested using ECL and will perform very well using this detection system.